Whilst most of us are mourning the loss of The Great British Bake off from our Tuesday night evenings, I have a recipe that might just help us move on and prepare us for next year. 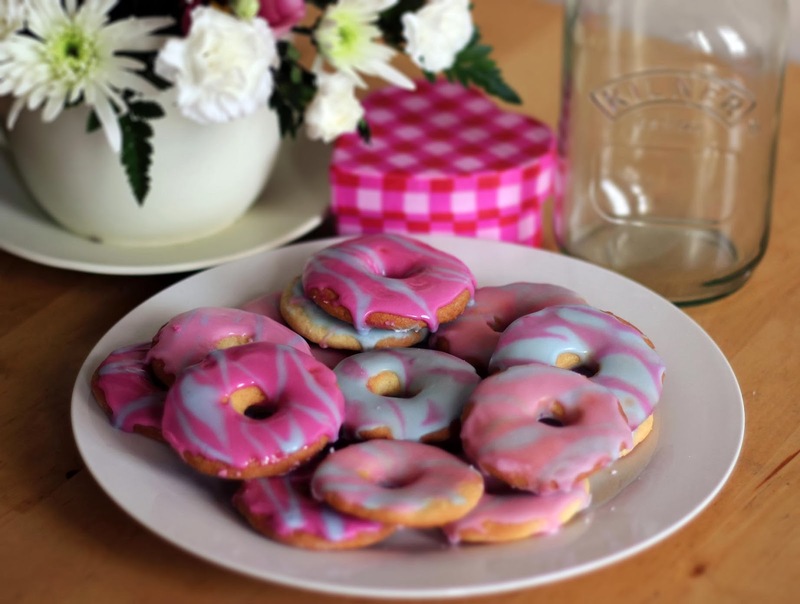 Party rings are one of my all time favourite biscuits, but I was really shocked when I found out recently that they aren't vegetarian as they contain pork gelatine. So I took it upon myself to create my own version, these were really easy to make and they don't take too long to bake either. In a large mixing bowl cream the sugar and butter together, once mixed well together add the eggs and baking powder. Then stir in the flour and the sallt, mix the ingredients together until it makes a dough like mixture. The dough then needs to sit in the fridge for at least one hour to chill. Pre-heat the oven to 200 degrees and take out the dough from the fridge, flour your surface and rolling pin and begin to roll it out. Take a medium sized circle cookie cutter and a smaller circle cutter ( I didn't have one of these I just used a cap from a piping bag) and cut out your shapes until you're left with a ring. Lay the rings onto a baking tray lined with greaseproof paper and put into the oven for 8-10 minutes. Once baked they need to cool before they're iced. For my icing I made the measurements up myself but I added smaller amounts of water to the icing sugar until I was happy with the consistency. It's really important not to add too much water otherwise you'll end up having to use lots of icing sugar to thicken it up again. When decorating the biscuits I chose one colour to be my base and the other colour will be used for the stripes. Put your base icing on first and let it set for a around 10/20 seconds and using another spoon drizzle the other colour on top, so it creates the striped effect. Once you've done this to all your biscuits let it set in the fridge for a few hours and then they're ready to eat! If you make them, let me know how they come out!